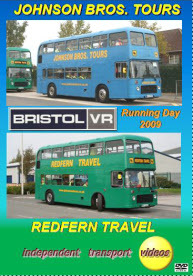 Johnson Brothers (Tours) Ltd of Hodthorpe and their subsidiary Redfern Travel based in Mansfield Woodhouse, run the largest operational fleet of Bristol VRTs remaining in 2009. Since 1997 they have held a number of Running Days where they operate their varied fleet of Series I, II and III Bristol VRs for enthusiasts to enjoy. Saturday 19th September 2009 was no exception, as the independent transport videos cameras were on hand to record the day’s events. The programme opens at the very modern Redfern Travel depot at Mansfield Woodhouse where both the blue liveried Johnsons VRs are lined up with the green Redfern Travel vehicles making an impressive sight! Our first trip out on the day is on board former Southern Vectis VR ODL 664R to the Johnsons depot at Hodthorpe. Travelling through pleasant scenery we reach Hodthorpe to inspect the vehicles in the depot parking area and return to Mansfield on board sister vehicle ODL 661R. Our next departure from Mansfield is with former York-West Yorkshire RWT 544R and Yorkshire Traction KKY 835P for the long journey to Killamarsh to visit the Coopers Tours Depot, then onto Halfway to the TM Travel depot and returning to Mansfield via the depot of McEwens Travel. There is plenty of onboard footage with outside shots to complement the experience of travelling on these iconic vehicles. Back at Mansfield Woodhouse depot we are treated to Johnsons beautifully restored wartime Bedford OWB that was rebodied after the war with a Duple Vista body. GAL 967 was being prepared for a journey on board a low-loader and looks resplendent in the 1965 livery of Dukeries Coaches . Our final VR rides of the day are on board two 40 year old Bristol VRs. We travel out to Mansfield town centre on former Central SMT and Southern Vectis Series I, NGM 168G and return on former Eastern Scottish and Southern Vectis Series I, OSF 305G. A real treat for you to enjoy. As always we would like to thank every one at Johnsons and all that made this super day possible. This video programme will be superb addition to your ‘Bristol’ collection!